Don't make me pull this ice axe out of my hat and start singing the Beatle's tune "Maxwell's Silver Hammer"
Leave that to me . . .
WHACK! WHACK! Pinkie's Golden Shovel made Whoopie wish he were dead! Ohhhhhh......Now that is going to leave mark, ummm Comrade Whoopie hate to break this to you but we are fresh out of aspirin in the bunker, due to it being all used to treat our hang-overs after we found out that Teabagging, bush clone Brown stole the election from Coakley and all the Vodka we had sucked down to drown our sorrows. Commissarka Pinkie said;"I mean to persuade her otherwise, even if I have to bash her brains out with my shovel." Oh my.......... I'm not one to interfere with the Show Trials (since the Trial of my good friend Trotsky), but I feel the need here. I knew Olga's great grandmother back in the motherland. If ever there was the perfect Communist Woman, she was it. It was even rumored that Uncle Joe and her had a thing going. That's how respected and revered she was to the Party. When she entered the room it fell silent. Anyway, anyone with this womans blood in their veins can only be an asset to the Party. Please to consider this in your ruling Dear Pinkie and check under your pillow. You never know when the Fabrege Bird may deposit a new egg. Thank you for this photo, Grigori. Well, well! It looks as if Olga Katrina's great-grandmother and your pal Trotsky ran afoul of the same assassin. I DENOUNCE COLONEL 7.62, RED ROOSTER, COMRADE WHOOPIE, GRIGORI E.R. and because I've fallen behind on my denouncement quota and need to catch up to be current for the month. Perhaps THIS will convince you of my innocence? Most intriguing evidence Thoughtcriminal Olga Katrina, we will definitely have to consider this after your execution during this trial. We will lock this in the Wombat Factory safe for safe keeping. MEANWHILE, it's getting downright disgusting in this People's Courtroom, their must be at least half a dozen Ben Nelson's up in this mug! Good Lenin comrades have you not read The Current Truth!?! We are FREEZING, freezing I say, domestic spending. This means all comrades used to taking bribes and grift -- NEED TO GET THEIR PRIORITIES IN ORDER and do it under the table not above -- The People(tm) have had enough of this open shameless grifting and bribery, and can you blame them!?! How many rents have we paid? How many cars have we gassed up? How many received their stimulus!?! Well all of them, but lets not count getting screwed, ok... Comrade Obama wants to make it clear after a briefing by Bill The Groper that all this frivolous grift and groping NEEDS TO STOP! So please comrades just collect the evidence and we, Red Rooster, The Peoples Prosecutor, will lock it away for safe keeping for The Children(TM)... for The People(TM)... for Social Justice(TM)! MEANWHILE, it's getting downright disgusting in this People's Courtroom, their must be at least half a dozen Ben Nelson's up in this mug! Good Lenin comrades have you not read The Current Truth!?! We are FREEZING, freezing I say, domestic spending. Agreed.....Number two pencils are now frozen at the agreed price, golly goshers I love being a progressive. I for one think all pencils should be banned, as they contain lead and you know how people like to chew on pencils. This could lead to lead poisoning. And if we can't ban them outright, at the very least the government should require that all pencils be prominently labeled with a warning, in big enough letters that everyone should be able to see it without having to squint or look underneath anything. WARNING: THE U.S. DEPARTMENT OF PENCIL SAFETY HAS DETERMINED THAT CHEWING ON PENCILS COULD CAUSE LEAD POISONING, WHICH IN TURN COULD LEAD TO BIRTH DEFECTS, INSANITY, IMPOTENCE, CANCER, YADA YADA. Clearly we need federal funding for further study of this important issue. We need to conduct studies of children who chew pencils versus those who don't, and see if the former had a higher rate of learning disabilities than the latter. If so, then we will also need to create a new disability requiring further federal funding. Oh, and don't forget the Awareness Ribbon. My only concern at this point is when you sharpen the pencil, you'll lose some of the wording on the warning, and depending on the location of words on the pencil, people could end up thinking that chewing on pencils will give them sanity and even potence, at which point we'll see millions of old men chewing on pencils. And not to get their sanity back, either. I don't know what to do about that except call for more federal funds! That's what the bribe money was for. More federal funds! 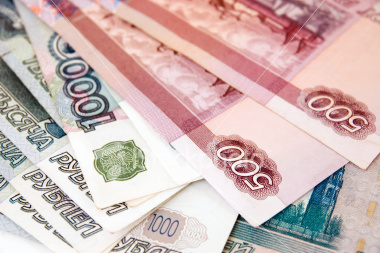 Take the rubles if you think the dollars are worthless. I assure you there's plenty of money to buy redistribute to yourself a nice hotel even after accounting for Bu$hitler's The Federal Reserve's inflationary policies. Thanks Pinkie, you make it hurt so good. Oh and Col. 7.62, the paradise of which I speak is the inner sanctum sub rosa. A place reeking of patchouli, where the curtains are tie dyed and sticky bears bop (aka: the bunker). I just hope my sacrifice got everyone back on track and down to business. Too much frivolity comrades, too much. There'll be time for that when the work is done. And now I must rub some Tiger Balm on my forehead and go lie down. And this is why you Reds never get anything done. Everything is by committee. Very inefficient. So much bickering and squabbling and politics. Under capitalism I would've made an executive decision and shot these people already. I denounce KKKapitalism! Executive decisions indeed? That takes away Power from The People! It's different when The Party does it. Because then that is an executive order by consensus. I let Partitioned Pasternak know that he has been missed, but I havn't heard anything yet. I saw a bumper sticker today that said, "I'm Pro-Choice about Lightbulbs." I was disturbed. How dare he liken the kkkapitalistic nonsense of free markets in the lightbulb industry to the basic, most urgent, civil rights of a woman to do as she please with her very own body? It is highly silly and therefore, highly unprogressive. He was driving a pickup truck too, so that proves what he says can make no sense whatsoever. Just because the Government Electric gets the monopoly on those twirly lightbulbs that I have mentioned before, it doesn't mean it isn't fair. It's fair to them. Fair to the whales who are saved by the stopping of global warming when we light our houses with twirly lights which help bring universal utopic peace to the world. Let freedom ring! Freedom to bear our bosoms. Freedom to do pot. Freedom to burst a bubble. Death to sarcastic baffoons in racist white pickups. Death to energy gulping, irresponible lightbulb gluttons. Let freedom ring! Freedom to bear our bosoms. Freedom to do pot. Freedom to burst a bubble. Death to sarcastic buffoons in racist white pickups. Death to energy gulping, irresponsible light-bulb gluttons. I am an environmentalist, Casserole Czar. The only environment we live in. The economic environment. The environment we live in is interdependent and it is fragile. Industry is the forest of our nurture. And if people cut back precipitately on energy based on some damn foolish Madelene Bassett ideas about how the world works because of all the propaganda about "energy gulping" then they will kill the electric and the oil industries. And in that will dry up the forests of industry that feed us and create deserts of poverty where there was plenitude. You are quite welcome Commissarka Pinkie. Let me just say that it's a glorious privilege to be your bailiff!!! I have had my shovel cleaned and am ready to go. The benefits are truly Proggerific! So looking forward to whacking working for you... here's a little something for you. Just a small token to say thank you for this most marvelous opportunity to serve the Party! Your most obedient worker of the world. Most interesting comrades. While we were out on our vodka drinking binge and decadence party attending to the peoples business, the thoughtcriminal Casserole Czar deleted her anxious post? As People's Prosecutors, it has to be questioned why the thoughtcriminal did this? Perhaps she does not feel the guilt and anxiety and fear The Party desires? Still waiting for my hotel! 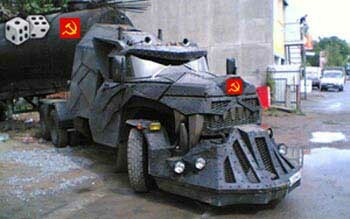 Comrade Nika, thank you much for the "trifles"; however, I don't think being my bailiff entitles you to those boots or that--that--that vehicle, so I will take those as well as the cute nesting dolls, and I'll enjoy smearing that caviar all over ShovelReady's gleaming steel torso and then licking it off--provided the weather isn't so cold that my tongue ends up stuck to him. But your offerings are so much more impressive than anything the Thoughtcriminals on show trial have deigned to give me. Are you sure you're not looking to be denounced yourself? And where have they all gone to now? What??? How much bigger does a pie need to be to be more impressive than a set of nesting dolls? You can't eat nesting dolls. They don't nourish you or bring a smile to your face. Well, maybe they do bring a smile right before you smash them with your shovel. If you want to smear something on ShovelReady, smear that whipped cream! 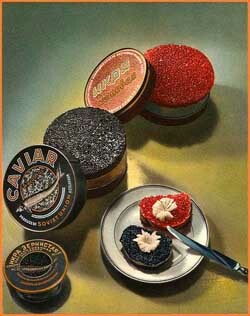 It has a much better aftertaste than caviar! You are right that I began to lose my fear...I thought the trial was over! I hadn't heard from anyone for awhile and figured I was in the clear!!! You prosecutors and judges are too shifty. You lure us in with your desire for bribes, then you slap us on the back of the head with your gardening gloves. I for one, am spinning dizzily...teetering back and forth from fear to relief. Other than that, I've been too busy celebrating with my own little vodka and beet top fizzy pop party with the passing of the Kalifornia Health Care Plan, which blurs my vision as well when I look back and forth between it and our bank account. But not to worry, the State's optometry center is open from 10 a.m.-2 p.m. daily--well, at least on odd days of the month, except for Saturdays, Sundays and all real and imagined holidays. It is also closed for lunch between 11 a.m. and 1 p.m. However, all this aside, I have no excuse and am in the wrong. For anything and everything. And again, I beg to receive the court's merciful end of the shovel. (Am I the only one still groveling around here? Not that I mind, I mean, I rather enjoy it, but...) Did they get out early or something? Passed on to the next phase behind closed doors? I havn't been able to do much writing lately, but I'm with the Cube in spirit, even if the pen eludes me. Praise Obama you are right! Kalifornia Komrades are moving forward with The Revolution(TM)!!! Hail Obama, Casserole Czar, your kollective kalifornia kooking is working!!! As for komrade Obama bowing, OF COURSE HE'S BOWING, the Most Esteemed Comrade he bowed to was Asian(hyphen)American! This is what we do Comrade, we celebrate racial stereotypes differences. This way we do not demean another culture with equality.... er, wait... my tinfoil hat is out of tune, I'll have to get back to you on that. As Peoples Prosecutor, we hereby admonish Casserole Czar from further prosecution and ask the court to pull the trigger render peoples justice upon this thoughtcriminal. As for the Thoughtcriminal Olga Katrina, it seems Her Honor The High Justice Commissarka Pinkie is not please with the evidence presented thus far, and in the name of The People(TM) we request further evidence of this thoughtcriminals SUPPOSED innocence! I have looked at the evidence and have come to this horrible conclusion. They are guilty as sin and deserve a good shovel whacking but..........If we do that it may not be good 'For the Children' to watch. Therefore in order to spare the children from watching this dispense of peoples justice, I ask that you rule that they are forgiven and send these thought criminals into the Inner Bunker where we can do our whacking in private. A trip down the elevator deep below the Lubiyanka will do them good. Judge Pinkie, their security has been cleared and their passes will be dispatched to you for your counter signature. Hmmm... what about some CHOCOLATE for Commissarka? Don't give it a second thought Olga Katrina. The property of capitalists is ours for the taking. The ends justify the means. Haven't you been reading Saul Alinsky? These iStockPhoto pigs are thieves themselves. The light belongs to everyone equally. All they did was capture reflected light with their camera thingy and now they have the nerve to try and sell it back to us for their own profit. On top of that they post it unguarded on the People's internet and expect that no one will come along take it. What arrogance. I can see you suffer the thought crime of having a conscience. That will not do. Hence my "prog off" indicator. There is no "prog off" indicator deep in the bowels under Lubiyanka. Nobody can hear you scream "prog off" in the bunker. I also suspect you are trying to induce Judge Pinkie into The People's Creme™ production with Ex-Lax disguised as "chocolate". As Peoples Prosecuter, we have seen ENOUGH ALREADY! These proles are worthless scoundrels, not even worthy of a slice of bread and a single beet. My vodka ration has run dry listening to their ever present KAPITALIST LIES! Please dispose of these thoughtcriminals Most Honorable Judge Commissarka Pinkie. Comrade Nika! As my bailiff, you are also my food taster. You will eat one of the chocolates Olga Katrina has given me, and if nothing--shall we say, "excessively untoward" happens within 8-12 hours, then you may give the rest to me. Yes, Rooster, I tire of these thoughtcriminals and their shenanigans--especially Olga, who never gave me any of her hotels--and besides, I want to spend some more time with my new boyfriend. TO THE WALL WITH THEM!!! Ahh, did I miss something? I got so bored with the infighting, begging, whining, pleading, faked evidence, planted evidence, and other progressive behaviors, that I grabbed Comrade Rooster, and wormholed 12 hours forward to see the end results. A most equal judgement Commissarka. 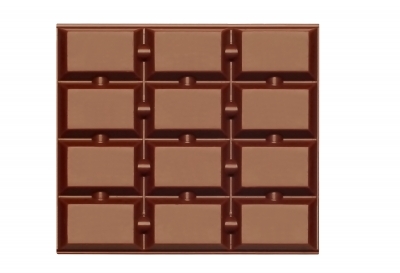 Oh, don't eat the chocolate. I wish to thank the People's Court for ending this trial once and for all! It's Bush's fault I got into this mess. Commissarka Pinkie, of course you're welcome to those boots. I um, uh, liberated them from Meshell's Jimmy Choos collection and I know she would be thrilled for you to have them. About the vehicle (I can tell it took your breath away) maybe you would prefer this one? So sorry for the confusion, this is a beautiful bottle of vodka cleverly designed to fool vodka thieves. I assure you Commissarka Pinkie I am not looking to be denounced! In my Jiffi-Lobo addled mind I hoped meant felt this to be a pre-emptive measure. As has been said many times here at The Cube, you are The Most Caring Prog Evah! (If you are subtly looking for more gifts, something can be arranged).
" 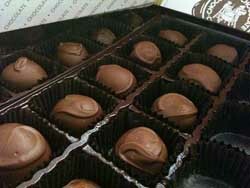 As my bailiff, you are also my food taster"
DO NOT EAT THE CHOCOLATE!!! Thank you, thank you, Comrade Nika! 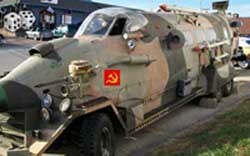 What is that on the front of that vehicle, a cow catcher? Oh wait, silly me, must think Soylent Green--it's a prole catcher! That'll come in handy for breaking up teabagging parties. 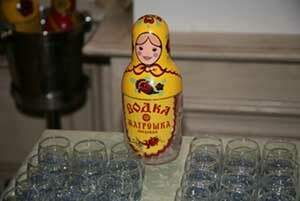 And that nesting doll disguised as a vodka bottle is absolutely darling! Dare I hope there are more bottles of vodka nestled inside one after another? Comrade Nika, your dedication to The Party is hereby noted and your name added to the appropriate lists. Keep it up and next time we have a show trial, there may be a special place for you. Commissarka Pinkie, just as I thought felt, you have glorious taste in Party vehicles! Unfortunately this bottle of vodka is not a nesting bottle, but, of course, there are more where that came from. "Comrade Nika, your dedication to The Party is hereby noted and your name added to the appropriate lists. Keep it up and next time we have a show trial, there may be a special place for you." Why thank you Commissarka Pinkie. I have dedicated my entire being to Dear Leader and The Party and will do whatever is necessary to ensure the Glorious World of Next Tuesday comes about as soon as possible. Due to the unfortunate incident with that ex-lax vomit inducing so-called chocolate, here is a little something to make up for it. I assure you that I have personally tested these and there is no need to fear. Chocolate covered cherries, enjoy! We need a new Snitch Czar!